2010 Re-issue of 1950 Vogue V1171 sewing pattern, misses' dress and belt, plus size FF 16-22. 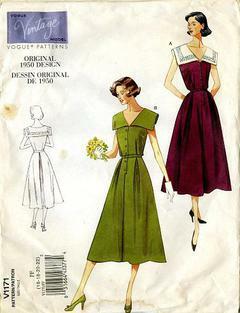 Fitted, below mid-calf length, flared sleeveless dresses. A, B have sailor collar, front and back pleats with waistline seam, button closure and belt with prong. (A) has contrast collar with purchased trim. 20% cut pieces at size 22, all sizes available. Pattern is in good condition, however, pieces are a bit wrinkled.